The latest Raspberry Pi, the Pi 3 Model B+, is the most recent iteration of hardware from the Raspberry Pi Foundation. No, it doesn’t have eMMC, it doesn’t have support for cellular connectivity, it doesn’t have USB 3.0, it doesn’t have SATA, it doesn’t have PCIe, and it doesn’t have any of the other unrealistic expectations for a thirty-five dollar computer. That doesn’t mean there wasn’t a lot of engineering that went into this new version of the Pi; on the contrary — the latest Pi is filled with custom silicon, new technologies, and it even has a neat embossed RF shield. On the Raspberry Pi blog, [James Adams] went over the work that went into what is probably the most significant part of the new Raspberry Pi. It has new, custom silicon in the power supply. This is a chip that was designed for the Raspberry Pi, and it’s a great lesson on what you can do when you know you’ll be making millions of a thing. The first few generations of the Raspberry Pi, from the original Model B to the Zero, used on-chip power supplies. This is what you would expect when the RAM is soldered directly to the CPU. With the introduction of the Raspberry Pi 2, the RAM was decoupled from the CPU, and that meant providing more power for more cores, and the rails required for LPDDR2 memory. The Pi 2 required voltages of 5V, 3.3V, 1.8V, and 1.2V, and the sequencing to bring them all up in order. This is the job for a power management IC (PMIC), but surprisingly all the PMICs available were more expensive than the Pi 2’s discrete solution. 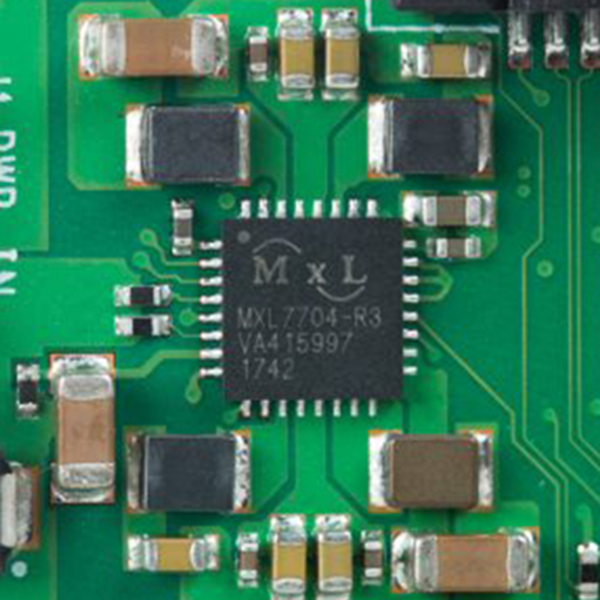 The MXL7704, with four switching power supplies. The four symmetric gray and brown bits are inductors. However, where there are semiconductor companies, there’s a possibility of having a custom chip made. [James] talked to [Peter Coyle] of Exar in 2015 (Exar was then bought by MaxLinear last year) about building a custom chip to supply all the voltages found in the Raspberry Pi. The result was the MXL7704, delivered just in time for the production of the Raspberry Pi 3B+. The new chip takes the 5V in from the USB port and converts that to two 3.3V rails, 1.8V and 1.2V for the LPDDR2 memory, 1.2V nominal for the CPU, which can be raised and lowered via I2C. This is an impressive bit of engineering, and as any hardware designer knows, getting the power right is the first step to a successful product. With the new MXL7704 chip found in the Raspberry Pi 3B+, the Pi ecosystem now has a simple and cheap chip for all their future revisions. It might not be SATA or PCIe or eMMC or a kitchen sink, but this is the kind of engineering that gives you a successful product rather than a single board computer that will be quickly forgotten.